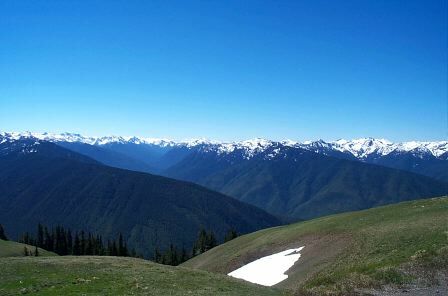 Hurricane Ridge is one of the major attractions in Olympic National Park, rivaled only by the Hoh Rain Forest. It provides an easy route into the heart of the park, where one can see the great mountains and explore the high alpine country. The visitor center at about 5200' offers spectacular views of Mount Olympus and the Lillian Ridge and the surrounding fields can be full of wildflowers taking advantage of the brief growing season. If one wanders a bit, there are also lovely views of the Strait of San Juan de Fuca and Vancouver Island. Wildlife includes deer, who will lick the salt off the bumper of your car, lumbering marmots and the occasional bear. Part of the fun of this area is the drive into the mountains. It starts out as perfectly beautiful as the road winds through the forest. A ways up you start getting the first overlooks, with stunning views of the Strait of San Juan de Fuca and the islands and mountains beyond. Then, after the three tunnels, you start getting glimpses of the mountains themselves, but, then, as you approach Hurricane Ridge, you get a sense of being near the top of the world. You can see the alpine meadows and the sharp peak of Sunrise Point. Then, you take the final turn into the parking lot, and there it is, the great bowl of mountains that comprise the heart of Olympic National Park. Even on cloudy days down below, this great valley is often clear, with the clouds unable to climb over its mountain walls. Keep your eyes on the road, park your car, and get out and explore. From Port Angeles, turn south off route 101 and take Race Street past the visitor center on your right. Take the next right turn after this and head into the hills. The road is curvy, but well paved and graded. It is often closed during the winter, particularly on weekdays, and there may be delays in the spring when work crews are digging it out and regrading it. 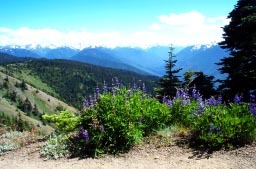 There are actually a number of great places to walk starting at or near the Hurricane Ridge visitor center. Most people are satisfied exploring the alpine meadow across the parking lot from the center with its deer, wildflowers and views of the Olympics and the strait. For a bit more of a work out, head up to Sunrise Point. If you want a more serious hike, drive down to the Hurricane Hill trailhead and take the handicapped accessible hike along a mountain ridge to Hurricane Hill. Hurricane Hill is a great introduction to the high country, especially if you want to do more than just wander around the meadows near the visitor center. Just drive out of the far end of the parking lot and go about a mile or so to the end of the road. Here is an amazing, handicapped access trail that runs along a ridge with spectacular views on either side. The climb to Hurricane Hill is about 650' above the parking lot, but along the way you will find meadows full of wild flowers, alpine forest and views, views, views. For more on the Hurricane Hill Trail, click here. We often just go up to Hurricane Ridge to wander about and see how the snow is melting in the late spring, but when we want a more serious climb, we don't drive all the way up to the visitor center. About a mile or two before the top, we stop at the trailhead for the Switchback Trail to Klahane Ridge, with its rushing waterfall that then passes under the road. 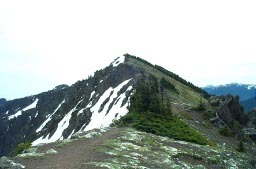 This is a steep but rewarding trail that climbs nearly 1500' to Klahane Ridge with its spectacular views both north and south. The trail is a steep one, and the air is a bit thin, so do bring plenty of water and wear sunblock. The climb starts steeply along the waterfall and then vanishes into the forest. Keep panting. After your second coronary failure, you will emerge in an alpine meadow, and the trail will start to get easier. There is at least one false turn, where the trail has been rerouted. Go right here, rather than heading into the woods. At the intersection with the trail to the Hurricane Ridge visitor center, follow the sign and go right towards Klahane Ridge. The worst is over; you still must ascend 800 feet, but the switchbacks are much easier. Don't give up. After a while, the rocky crags that loomed above you will no longer seem so far away, and you will see the Lillian Ridge in the distance to the south. This area is sometimes called the "hanging gardens" because of the numerous flowering plants: lupine, phlox, cow parsnip, Indian paintbrush, glacier lilies and numerous others. One charm of taking this trail a number of times is the way the different flowers bloom at different elevations as the season progresses. Each has a different perfume, and the fragrance becomes intoxicating. There are a few gravelly areas, but otherwise this is a strenuous but easy to follow trail. It has numerous switchbacks that ease the climb. Eventually, it leads out into the open crags of the ridge itself. Here you have spectacular views, both north and south, out among the rocky crags. The euphoria induced by the fragrant air, the views, and the sense of accomplishment will remain with you forever. Keep your eyes open for marmots. One lives under the big rock on the right, just before the trail opens out to the ridge itself. From here, if you can stand it, you can walk down to Heather Park or Lake Angeles and then down to the Heart of the Hills, a descent of nearly 4000', or you can explore the nearby hills. We have been told that one can climb Mount Angeles, to the west, with no special equipment, if you are willing to scramble. We are not willing to scramble, so it would be good idea to check another source before trying this. For more on the Klahane Ridge Trail, click here. Make sure you have enough fuel in your tank before driving up. Hurricane Ridge is only 15 miles from town, but it is one mile up, so you will not make it on the fumes. If you make the ascent to the ridge, and you find that the views are obscured by clouds, wait. Often the wind will shift, and the mountains will emerge in all their glory. However, we have enjoyed this hike in both sun and mist (and light snow). Fog deepens the sense of mystery that is always present here. Do take something warm, though, because it gets quite chilly when the sun disappears. Hiking sticks are a blessing on this trail as they spare your knees on the descent and help you pull yourself along on the ascent. This trail makes you feel as if you had Champagne in your veins, but please keep the feeling metaphorical. One of us once hiked up here after having wine with lunch, and she made it up to the top in a state of gasping misery. Alcohol doesn't mix AT ALL with mountain hiking as the combination of thin air, dryness, and lactic acid in the muscles makes even a small amount in the system a horrible drag. Save the fizz for your celebration off the mountain and off the road later. There is no cell phone reception on this hike until you reach the ridge. Here you have great line of sight connections to the cell phone towers of Port Angeles. In fact, reception is better than in town itself, though we cannot recommend hauling up here just to make a cell phone call to your friends.